After the Guardian expose, the UK Royal College of Paediatrics and Child Health (RCPCH) seems to be sliding deeper into trouble as a catalogue of ‘errors’ by the organising team comes to light. 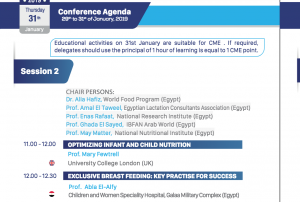 The RCPCH organising team in Egypt used the names of IBFAN, the Egyptian Lactation Consultants Association (ELCA) and World Food Program Egypt (who all have policies that would forbid such attendance) in an attempt to whitewash the conference. 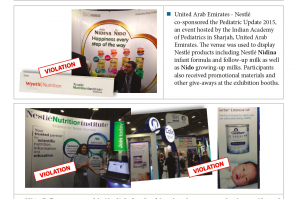 The MENA Conference started on the 29th January and is being sponsored by baby food companies Nestlé and Danone, both major and systematic violators of the WHO Code of Marketing of Breastmilk Substitutes. See examples of violations taken from IBFAN ICDC’s Breaking the Rules report below. Despite this the RCPCH claims that the conference does not contravene the repeated recommendations of the World Health Assembly since 1996 that such sponsorship is an unacceptable conflict of interest. Before the conference began the President of the (RCPCH), Prof Russell Viner, received a barrage of complaints from pediatricians and health groups including from Prof Nigel Rollins, of WHO’s department of maternal, newborn, child and adolescent health, who signed the letter in his personal capacity as a member of the RCPCH. The RCPCH have written to us and although accepting that the use of IBFAN’s name was an error, denied that this was an attempt to whitewash the Conference and that there was a session on exclusive breastfeeding. I was asked to correct or take down this Blog. 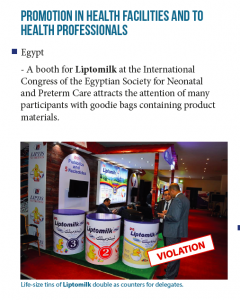 I investigated further and discovered another series of ‘errors’ – two other organisations, the Egyptian Lactation Consultants Association (ELCA) and World Food Program Egypt were listed in the programme without their permission and another Code violating company was listed as a sponsor. We await the RCPCH response. 2. On Sunday IBFAN discovered that the name of Dr Ghada Sayed, IBFAN Arab World Coordinator, was listed in the programme as a chair of one of the sessions despite having declined to attend on the 16th January when she found out about the formula company sponsorship. Dr Sayed complained to the organisers and asked for her name to be taken down. The organisers did this – only to replace it with a new name Prof Trez Boshra. But the IBFAN name was retained alongside. Prof Boshra is not known to IBFAN and has no authority to represent us. 4 Dr Alia Hafez works for the World Food Program Egypt, an agency that takes a strong stand against formula company sponsorship. Dr Hafez never responded to the RCPCH invitation with any official confirmation to participate or support the conference because she received no response to her request for more information regarding partners and sponsors. When she saw a copy being circulated of an image of the agenda with her name and affiliation on a panel together with other colleagues she texted the organisers to confirm that she was not participating and had not even seen the agenda. On the 28th January she saw the website of the conference and the updated agenda with the name of another person, this time listed with her organisation’s affiliation even though this person is not affiliated to it. She corresponded with the organizers again by phone calls, emails and text messages to remedy this, with no response to date. 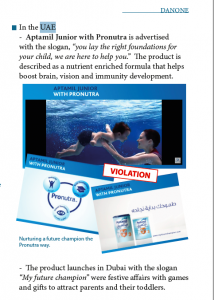 IBFAN’s reputation and the trust placed in it by policy makers, health professionals and parents over the years, is founded on its independence, its sound monitoring and its willingness to speak out in defence of child health in its many campaigns and work programmes, including company campaigns such as the International Nestlé Boycott and the Danono campaign. IBFAN’s policy of refusing baby food industry sponsorship is central to its reputation. 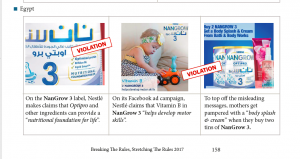 Over the years the baby food industry, especially Nestlé, have tried to use IBFAN’s name to support claims that their policies and practices are Code compliant and that they are an appropriate partner in health and education campaigns.